Though almost everyone loves having guests stay over at their home, it’s never pleasant to be caught unprepared. Not having enough bed space available for your guest can be a stressful situation as you frantically scramble to find an appropriate couch for them to use. For this reason, trundle beds have been surging in popularity recently. These beds are often built as decorative day beds with an extra mattress tucked neatly underneath. With a few simple movements, you can pull out the trundle bed and instantly have an entire extra space available for your guest. Whether you host lots of sleepovers for your children or have visiting relatives that love to stop by, a trundle bed will make your hosting life far easier. However, choosing the right kind of trundle bed can be difficult. There are a wide variety of styles available; some that are ornately decorated to perfect match your spare room’s theme, and others that are so basic that they are completely nondescript. If you already have a daybed with about a foot of clearance, it’s even possible to simply buy a trundle and turn the bed into a trundle bed. There are so many types of trundle bed frames available on the market today that it can be difficult to know what kind to purchase, which is why we are here to help. We’ve assembled this guide to help you choose the right trundle bed for your situation. Below you can find descriptions of some of the top trundles available right now and the defining characteristics of each one. With the help of this guide, your search for the perfect trundle bed has never been easier. We listed here the top rated trundle frames on Amazon.com. Mattresses & bedding are not included. Click on photo for details, color options, current prices and customers’ reviews. Metal trundle beds are considered to be more durable than their wooden counterparts. They require minimum upkeep. Can last for years without the slightest of problems. And some of the new designs can give heartburn to anyone who feels that wood furniture is the more aesthetic choice. But, as is the case with any type of furniture, buying metal trundle beds is not without its share of pitfalls. Furniture descriptions and labels can be grossly overrated and downright misleading most of the times, thanks to the FTC relaxing its guidelines. That’s precisely why we decided to wade through the muck and bring out the best metal trundle beds in 2019 for you. The Leggett & Platt Bianca is a combination of part metal and part wood which gives it an unparalleled appeal. The main frame is made of carbon steel in a hammered pewter finish (bluish), while the four posts that connect the frame and the rails, are made of hardwood in an Espresso finish. The arched panels, the gently sloping rails and the round finials topping the posts are reminiscent of the classic daybeds of yore. Overall, the design looks pleasing and simple enough to blend with most décor themes. This is a twin day bed by the way with a pop-up trundle on casters underneath. The trundle can be pulled out like a drawer and both beds can be clubbed together to form a king bed if need be. Also includes a euro top spring support deck. There’s no provision to tie the beds together though. And they tend to shift on hardwood flooring. Get yourself some ties to secure the two together. Also, the instructions are a nightmare to figure out. Just lay out the pieces together and you should be able to manage without reading the gibberish. Our view: Complete value for money. With a 10-year limited warranty against manufacturing defects, it’s hard to go wrong with this. We were amazed at how compact the Zinus Newport Twin daybed looks. Can put an unused wall in a small guest room or home office to good use. Throw some rugs and it works as a stylish sofa during the day. Throw a pillow and it transforms into a daybed for a quick nap. The design is simple yet classy. No bells and whistles. And when an unexpected guest drops in and needs to bump, you just pull out the twin-sized trundle underneath to be used as a separate bed entirely. Not a pop-up mind you. The bed is made of stainless steel and is as sturdy as a rock. No squeaks or creaks when assembled. If anything the trundle could have done with two more locking wheels. Only two wheels have locks and if you have hardwood floor, the trundle might shift. You can swap them out or use any heavy object to prevent this. Another good feature is the amount of space under the day bed frame. The trundle can easily accommodate a 9” mattress which is excellent. Most trundles only fit a 7-incher. Our view: Looking for a compact metal trundle bed for your kiddie room or guest room? Look no further. Great price, solid build quality and a five-year warranty to top it off. If you worry about your trundle bed collapsing on your guests at night, this superior design from Dream Solution will get rid of your concerns. Designed for maximum strength and durability, this bed has an innovative gravity locking system to keep it perfectly stable even when elevated. It’s well suited for being used as two separate beds or put together into a king size design. You can change the angle of the side rails to stop the mattress from slipping, and a locking spring mechanism will keep the bed blocked in place when elevated. The trundles are easy to set up, making them perfect for children to put together for their sleepovers. This design is one of the most stable, long lasting trundles you can buy. Measurements: 77 x 41 x 17 inches. Another great design from Zinus. This is the Ironline Twin daybed which is styled more like a bunkbed than a conventional daybed. Makes it perfect for dorms, small apartments and of course, guest rooms. It draws inspiration from the modern or industrial-styled designs, with clean lines and two wooden boards in place of rails. The bottom trundle rests on casters. But you can always remove the casters if you need to squeeze in a thicker mattress under the daybed. Normally, it can accommodate a 7-incher. Without casters, you can use an 8-inch mattress with it. By the way, this is an open design that doesn’t have a backrest. So, you can always buy two of these for your children’s room and have two additional beds for the guests. You can pull out the trundle from either sides as well. The only possible gripe that we have with it is the positioning of the slats. There’s too much gap in between them which can cause a normal mattress to sink after sometime. You can either get a hybrid mattress (spring and foam) or get some MDF boards and screw it to the frame for some added support. Having said that, lots of users use the bed without these modifications and have no complaints whatsoever. 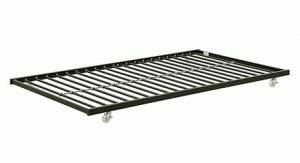 Our view: Zinus is one of the best brands to buy metal trundle beds from. They offer a five-year warranty and you’d be hard pressed to find a better bed at this price. Keep your room looking sleek and modern with this day bed that disguises a trundle underneath a twin size frame. Simply pull on the trundle and you will be able to have an additional sleeping space for friends and family members to crash on. The metal and wood design combination keeps this bed looking contemporary without drawing too much attention to itself, and the entire bed is easy to assemble with a few basic tools. Metal slats support the weight of the mattresses, meaning that no box spring is necessary. This day bed is the perfect option for any home that needs additional bed spaces and has minimal space. Measurements: 75″ L x 39″ W x 26″ H. Trundle:70″ x 38.5″ x 4.2″H. The DHP Manila is one of the oldest metal trundle beds to be sold online. But it still outsells a lot of newer models. That’s testimony to its quality. This is a simple trundle bed that has a classic, Victorian design. Almost like a minimalized four-poster with rounded finials to boot. Looks elegant and blends into any décor theme. Apart from white, it is available in Bronze, gold and Pink. We personally loved the Bronze, which is more like a matte-brown in a grunge finish. The daybed can accommodate a 10-inch mattress while the trundle can do with an 8-incher. The trundle bed is a pull-out variety and can be used separately if need be. The DHP Manila is one of the only metal trundle beds with a max load capacity of 400 lbs. Perfect for a large adult. It is made of heavy steel and is sturdy when assembled. Our view: The DHP Manila is an infallible choice. It has a proven track record, looks stunning and has a very affordable price tag. You want your home to have a clean, modern, aesthetic, so why wouldn’t you strive to have your daybed perfectly match your decor? This gorgeous bed from DHP has a stunning, modern design that is sophisticated in its simplicity. Not only will it enhance any room it’s placed in, it can also be used as a roll out trundle to host any guests that choose to stay with you. Created with a durable metal frame, this bed is designed to last for years and is the perfect fit for any standard sized twin mattress. If you want a daybed that has a light appearance that doesn’t overwhelm the entire space, this is the choice for you. Measurements: 41.5 x 77.5 x 41.5 inches. Available colors: bronze, white, gold and pink. This one is another tried, tested and proven daybed from DHP that has a more basic design as compared to the earlier one. But it’s beautiful nevertheless. The ornate headframe has a hint of Victorian styling. But it’s not overwhelming. Looks attractive enough to go with any décor theme. It’s a twin over twin trundle bed with a roll-out trundle on casters and a compact day bed on top. The daybed has a max weight capacity of a whopping 450 lbs. and comes with metal slats to support the mattress weight. There’s a metal leg in the middle to prevent the frame from bending. Some users have also added some blocks in the middle for added support, especially if the bed will be used by a large adult. The caveat is that adding the blocks would eat on valuable under-bed storage space. The DHP Twin Metal Daybed is available in white and black. Daybed with a weight capacity of 450 lbs. Our view: Just as we mentioned earlier, hard to go wrong with DHP. Pick any one of the two models listed here depending on your needs. This platform bed from Kings Brand furniture looks like the Japanese platform beds that are in vogue these days. No fancy frames or rails. Just a barebones platform with a pop-up trundle underneath. Made of heavy-duty steel, the bed is solid and stable. Doesn’t wobble or creak. Assembly is not as easy as it is with most of the other beds in this list. But you should be able to set it up in a couple of hours. The trundle is reasonably easy to collapse and open. Unlike some of the other trundle beds, there’s ample clearance in between the trundle bed and the daybed frame. This means that it works with a 10-inch mattress. Probably the only one so far that works with one. Installation tip: If you don’t line up the holes for the nuts and screws, then the trundle will sit two inches below the daybed when it pops out. Ensure that you install it correctly to avoid this problem. Our view: This Platform metal bed from Kings Brand is your budget-priced Japanese futon bed. It looks elegant, saves space and can double up as a King-sized bed when popped up. This trundle bed changes everything about how you can host your guests. As a daybed with a twist, the trundle bed in this innovative design can be propped up to the same level as the primary bed, making it perfect for couples to sleep together. For children and sleepovers, it can also be used as a regular trundle, providing two bed’s worth of space. The space saving trundle design makes this bed one of the most functional pieces of furniture that you can buy, as it’s ready to be used at just a moment’s notice. Just some simple assembly is required to put this bed together, and after you will have a highly functional sleeping space ready for your guests for years to come, making this bed a truly flexible option. Measurements: Daybed: 77” L x 41” W x 17”H. 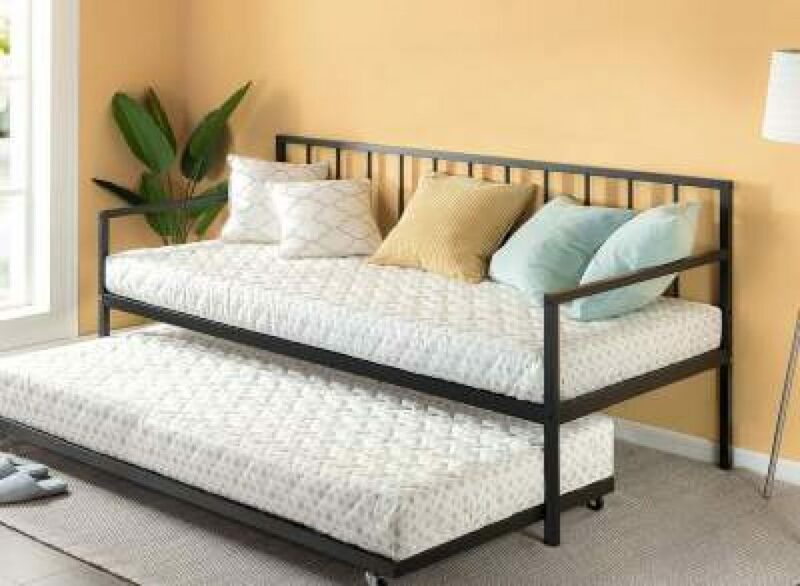 Trundle: 73″ L x: 39″ W.
If you hate when your trundle bed on casters starts to shift in the middle of the night, then this Metal Daybed from Homelegance is just what you need. The bottom trundle rests on two metal legs on the front and has three casters on the back. You only use the casters to pull the trundle out. The two metal legs keep it locked in position. Perfect for use even on hardwood floors. The upper day bed features classic styling with flowing scrollwork and curved rails. Is available in a glossy white finish. Both beds accommodate standard twin sized mattress. However, the clearance under the day bed frame is barely enough for a 7-inch mattress. Anything more and you’ll find it difficult to pull the bed out. Our view: Homeowners with hardwood floors often struggle to keep their trundle beds from shifting. The two metal legs on this trundle bed are a well thought-out addition. When it comes to buying metal furniture, most buyers are ignorant about the factors that they should consider. Here are a few that matter when you shop for trundle beds. Metal trundle beds can be made of a variety of metals. Some of them are stronger and more durable than others. Alloys like carbon steel, for example, offer excellent tensile strength and resistance to corrosion. These beds can last for years without the slightest signs of wear and tear. At times, the frame can be made of a tougher metal whereas the slats are a weaker (cheaper) variety. If you are unsure about the type of metal, reach out to the manufacturer and seek details. Metal trundles these days rival their wooden counterparts in terms of design and styling. If you are looking for a space saving option, the platform beds are your best bet. These have a sleek, low-profile design with clean lines. Perfect for modern and contemporary décor themes. The classic sleigh beds have witnessed a revival of sorts these days. So if you are craving the elegance and soft, ornate designs, you have your hands full with options. And if you seek a dramatic, focal point, then there’s the four poster. Why we even have a metal bed with a hint of wood thrown in for good measure. Metal beds tend to be deceiving in pictures. There are umpteen stories of a shopper realizing that the bed is too big for the room. Imagine the horror when they realize that they have to pay for shipping to return that monstrosity that probably weighs a ton. Relax. Just grab a measuring tape and measure the room where you intend to place the bed. Now compare the measurements with the dimensions of the bed. You should be good to go. The trundle is undoubtedly the primary reason why you look for trundle beds. So ensure that you know everything that there is to know about it. What mattress size will fit on the trundle? Is it a pull-out design or a pop-up one? Are all four caster wheels lockable? Is it easy to pull the casters out in a carpeted room? Does the bed shift on hardwood floor or tiles? Can you pull the trundle out from both directions? What is the maximum weight capacity of the trundle? What is the clearance in between the trundle and the day bed frame? Did we miss out on something? Give us a holler. We hope you enjoyed reading through our recommendations for the best metal trundle beds in 2019. For those that value simplicity with their daybeds, this product from Legget and Platt is a perfect option at a steal of a price. The Deluxe Daybed Hardware is available to be used either as a link spring or poly deck, ensuring that there is plenty of support in this bed, allowing it to be as comfortable as possible. The pop up bed frame is angled to the sides to keep the mattresses at the same level, allowing the bed to be used as a king. For the true minimalist, this is the right daybed to purchase. Measurements: 72.1 x 38.5 x 15.2 inches. Increase the sleeping options in your room by utilizing this space-saving trundle bed that’s designed to fit directly underneath your bed. Constructed from solid metal, this trundle bed features roller wheels and is small enough to fit under even low bed frames. With a weight limit of 500 pounds, you’ll be sure to find plenty of ways to put it to use. Measurements: 73 x 39 x 4 inches. Sometimes it’s easier just to buy the trundle and put it directly under an existing bed frame. The Zinus Newport trundle bed frame makes that option more natural than ever by providing a stylish and functional way for you to save space in your home while maximizing the sleeping options available. This trundle frame comes with premium quality steel slat support, and it’s easy to assemble in just minutes. You can use this bed frame without stress, as it comes with a worry-free five-year warranty. If you already have a day bed that you love, it can be difficult to find a trundle day bed that is just as beautiful. A better solution? Alter your daybed by purchasing this pull out trundle frame to go underneath it! Weighing just 24 pounds, this trundle perfectly fits a twin sized mattress and can be easily pushed underneath any bed, making for easy storage and even quicker preparation when a guest comes. You’ll be grateful for the ease and versatility of this model, as well as the affordable price point. Measurements: 39.25 in. W x 73.15 in. D x 4 in. You’ll forever be grateful to have this trundle bed handy when your kids have sleepovers or an unexpected guest shows up, as this bed in simple to set up and use at a moment’s notice. The small size means it is convenient to stow away under any regular sized day bed, and the stainless steel design ensures that the bed is created to be the highest quality in regards to strength and durability. Just add a twin sized mattress (not included) and this trundle will be ready to be used for any child or adult weighing less than 250 pounds. Measurements: 73 x 40 x 4 inches. You’ve got to love the best wooden trundle beds. They save space, look neat, can double up as a day bed when not in use and if you’re lucky, do their bit to contain clutter as well. That doesn’t make shopping for trundles any easier. The market has just exploded with options in the past few years as China and Vietnam jumped head first into the furniture industry. Just like everything else, you’ve got to be doubly sure about Chinese-made products. Put them under the magnifying glasses and analyze them minutely. We personally don’t hold a gripe against any country to be honest. We own tons of Asian made products. But we’ve dealt with poorly made furniture multiple times and know firsthand, how frustrating it can get to fix tiny niggles, like a broken frame which has to be shipped back. So, we decided to do the heavy lifting for you. Here are the best wooden trundle beds that money can buy in 2019. Once you are done browser-shopping, we will talk about the features that make these beds pop out from amongst the crowd. The Casey II Wood Daybed screams quality right from the moment you unbox it. The frames are thick solid wood and come in a warm, honey maple finish. Assembly is extremely easy. A one-man job at best. The bed looks stunning when fully assembled with the round finials and slats on the headboard. Almost a classic, minimalistic design. By the way it’s 81.5” long or wide, depending on what you call it. There’s no other daybed that’s as long as this one. The extra length means that it can easily accommodate an extra-large twin mattress on top. Comfortable for a tall adult guest. The bottom trundle accommodates a regular twin-sized mattress that’s 7-inches thick. The Casey II also includes wooden slats that can be screwed into the frame. So you save some dough otherwise spent on a box spring. Our take: Compact-sized trundle that can easily sleep one adult and two kids. Sturdy, solid wood construction, attractive design and great pricing. Can’t get better, can it? You’ll enjoy the open, symmetrical design of this concord bed that can be set up as a day bed or a traditional platform bed if you prefer. Conveniently sized with a trundle, you can fit it under the twin size rolling bed to avoid cluttering up a small space. Large storage drawers provide plenty of options for keeping your belongings under control, and their smooth open design won’t cause endless problems for you. Best of all, Atlanta furniture prides themselves on providing top quality furniture that is designed to be water and scratch resistant, ensuring you never have to stress about safety. This Urban Trundle bed from Atlantic furniture is made of solid rubber wood in a semi-gloss, tan finish. It is extremely rare to find a solid wood bed at this price point. Most other manufactures would stack particle board with a wooden frame. Not this one. The bed is 71” long and about 41.6” wide. The compact form factor means that it can easily fit into small to medium-sized rooms, like the kids’ room for example. Assembly is fairly easy. But it will take a couple of hours at least because you’ll have to drill holes to attach the slats to the frame. If you are mechanically challenged, we recommend that you have an extra pair of hands to help you with the installation. Despite the great pricing and the nearly flawless construction, there are couple of things that could have been better. There are two grooves on the frame that are used to grab the trundle and pull it out. If you have large fingers, then you might find it very difficult to grab the groove. Thankfully, an easy workaround is to fix two handles. Secondly, you cannot use this as a day bed as the head and bottom sides are not identical. Our view: The solid wood construction alone makes it a complete value for money deal. Despite a niggle or two, this trundle bed from Atlantic furniture is a great buy. Keep things cute and simple with this dark cherry-hued daybed that is a perfect accessory for any guest room. In fact, it’s pretty enough to be prominently displayed in your living room! You’ll never tire of looking at the sumptuous styling and classic finish, and a free replacement parts warranty cuts out the stress of the assembly process. Best of all, a convenient handle makes it easy to get a grip on the trundle under beds, and castor wheels ensure it glides wherever you need it. No one said that trundle beds had to look frumpy. This Modal daybed from Furniture of America looks classy with its contoured design and curved side frame. The dark cherry finish is a wonderful change from the norm and adds to its vintage appeal. It has a rubber wood frame with wood veneer used for the inner parts. That doesn’t take anything away from the quality though. It can easily accommodate one adult of 150 lbs. or two kids, on both the top as well as on the trundle. The trundle rolls out on casters and can accommodate a mattress of up to 7”. If you are looking for a thicker mattress, then check out the earlier options in this list of best wooden trundle beds. Assembly is pretty simple. The only gripe that we have is that there are no screw covers provided which leaves them exposed on the frame. Not a biggie. You can always buy a few yourself. Our view: It’s not solid wood like our earlier two picks. But there are users who have owned this amazing Nodal bed for over two years. Has held up beautifully. That’s all the testimony that we need about its quality. Make every guest feel welcome in your space by proving them with this cute and cozy daybed. Practical and stylish all in one, this bed is made with an open slat design to provide a stunning yet subtle look with clean lines. The silky smooth espresso finish makes the bed a great addition to any room without drawing too much attention to itself. There is a twelve-inch space under the frame for the included trundle to fit comfortably, ensuring you can expand the sleep space when necessary without cluttering up a mixed-use room. The Salem Daybed and Trundle combo is a beauty with ornate, sleighed arms and an extra wide frame. It can easily accommodate an XL twin mattress on top. The bed is crafted from solid rubber wood and features slats on the back board and the sides giving it a classic appeal. Despite the extra width, it looks neat and compact. Perfect for small rooms as well as for the large living room. 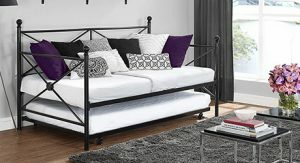 The package includes a link spring and a pop up frame for the trundle which at this price point is a premium addition. There’s about 12-inches of space in between the floor and the upper frame. This means that the trundle can accommodate a 7” mattress at best. That’s a minor niggle though. Our view: The Salem solid wood trundle bed is perfect for tall users who find a standard twin mattress too cramped. This Cherry day bed from Hillsdale looks exactly like our #1 pick, the Casey II, without the round finials. Instead, here we have a cottage-styled, beaded board design with arched silhouettes that looks rustic yet charming. And if you prefer a more contemporary take on the classic styling, then the bed is also available in glossy white. Made of solid wood all over (including the frame and the slats), the bed is as sturdy as a rock. Assembly is slightly trickier than some of the other beds included here. But nothing overly difficult. Just ensure that you lay out all the parts and use common sense to assemble them. Just like the Modal Daybed, this also ships without covers for the metallic bolts which look ungainly against the smooth wood finish. Just dab some paint on it. The upper bed is 81.5” and it can accommodate an extra-large twin mattress, as thick as you’d like. The bottom one though is limited to 7” thickness only like most other trundle beds. That by far, is not a deal breaker though. Our view: The Hillsdale daybed clubs a very cosy styling with a functional design. The solid wood construction and the extra-large size make it a great buy at this price point. The best part about wooden trundle beds is that you can always buy matching extension pieces to improve the functionality and the aesthetics. Here’s the Full Captain Daybed with a bookcase integrated into the headboard, constructed from solid wood in a merlot finish. Books, décor pieces, tiny knick-knacks, everything will be easily accessible now. It comes with three fully assembled drawers for storing your bed linen. And these are intuitively installed into the bed frame without adding to the bulk. To top it off, there’s ample storage space under the bed as well. Children love using this as a crawl space for imaginative gameplay. The bottom trundle rolls out on casters and it can be pulled out completely and used as a separate bed if need be. Both beds ship with a set of slats and there’s no need for a spring board. By the way, you can always order a full-sized 42” bookshelf that matches the headboard shelf. Our view: If you have the extra space, then there’s no better choice than this Full Captain Bookshelf with drawers. 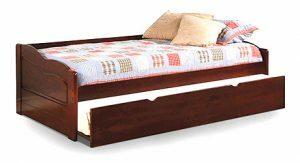 It is one of the best wooden trundle beds that we’ve seen and used. This Marco Island Captain’s bed is perfect for imaginative toddlers who like to sleep in their own oversized bed. It comes from Stork Craft, a brand renowned for its quality kiddie furniture. We particularly like the design with the rounded edges on the rails. The attention to detail is astute. Also, this is one of the only beds in this list that allows you to pull out the trundle from either side. Despite being made partly from wood composites (impossible to tell), the bed is incredibly sturdy. It has a maximum weight rating of 200 lbs. And your kid can easily accommodate their friends during impromptu sleepovers. We do have a small quibble with it though. The caster wheels on the trundle are too small for the bed. If you have carpet, then you will find it a chore to pull it out completely. Apart from this, the Stork Craft Marco Island bed is just perfect. Our view: This Marco Island bed maximizes space utilization. Kids obviously love it. But it can easily double up as a guest bed. Most homeowners decide to buy trundle beds for their guest rooms, home offices or for their kiddie rooms due to the space utilization these beds offer. And when not in use, they can double up as chaise lounges or couches. Here are some of the factors to consider before you buy wooden trundle beds. Wooden trundle beds usually come in standard sizes like Twin, Full and Queen. But variances among brands are common. Check the dimensions correctly before you select one. Also, decide on where you plan to place the bed as you will need enough room around it to pull out the trundle without bumping into other furniture. Check the mattress size that the beds can accommodate. Many trundle beds come in different sizes despite being advertised as a standard twin sized bed. Often, there’s enough room to accommodate an extra-large twin mattress on the top bed if it’s more than 79” inches long/wide. If the top bed will be used primarily by a tall adult, the additional space will make it more comfortable. The upper beds can accommodate a mattress of any thickness (in most designs). But there’s usually just 8-10 inches of space in between the floor and the upper bed frame. This limits the thickness of the mattress for the trundle to 7” or so. You can squeeze in an 8” one at times. But if there isn’t enough clearance for the bedsheet and pillow, then pulling out the trundle becomes difficult. The term ‘wood’ is often used to mislead buyers into believing that the bed is made of hardwood. But it can be used to describe wood veneer, wood composites or even particle board. Ensure that the trundle bed is made of solid wood. Even a solid wood frame will make it more durable than one completely made of composites. Last but not the least, there are tons of design options in trundle beds. From barebones platform styled beds to ornate Victorian ones, the sky is the limit. Pick one that blends with the rest of the furniture. If you’d like to use the trundle as a separate bed, check whether it can be pulled out completely. Many trundle beds have storage drawers. But the drawers are often flimsily made and shallow accommodating a couple of bedsheets at best. Check the dimensions of the drawers. Some beds also offer under-the-bed storage space. Check if that is an option. That’s it ladies and gentlemen. We hope that you enjoyed reading through our recommendations of the best wooden trundle beds. If you have anything to add to this, then do write to us. You’ll enjoy the clean, contemporary lines of the black vinyl daybed with an included roll out trundle bed. Cute enough to complement almost any décor, this bed is designed to look appropriate in most room sizes, and it can be used as a place to relax or sleep without seeming out of place. When you need some extra space, the trundle pulls out below without issue. Part of Homelegance’s Adra Collection, this trundle set offers a functional yet fashionable piece of furniture that you will enjoy for years to come. The modern elegance of the clean lines and light grey fabric on this daybed trundle duo will feel like a breath of fresh air in your home. Designed to be as functional as it is artistic, this daybed can blend into any room, and the included trundle bed is simple to access under the daybed to effortlessly expand your available sleeping space. For extra functionality, the bed comes with side arms for extra comfort, and only minor assembly is required. Keep your space looking cute with this modern take on the classic daybed. Versatile enough to be used as both a couch or a bed, the brown faux leather design provides a contemporary chic look that complements modern aesthetics. The backless design makes the GHP-brand daybed ideally suited for working as a room divider or even merely placed against the wall. The included trundle bed provides extra functionality by allowing you to sleep additional guests if the need arises. And no worries about getting a box spring; the multiple wooden slats in the frame eliminates the need for one. Add an extra touch of class to your home by adding this creamy-white daybed to the mix. Made to be as functional as possible without compromising design, the bed is constructed with faux leather upholstery and high-quality hardwood. For extra sleeping space, the lower twin-sized trundle bed slides gracefully from under the frame. You get all the benefits of a versatile piece of furniture without any style negatives. And best of all, the trundle design in this bed frame is so subtle that no one but you will know it’s there. Don’t let a need for extra sleeping space compromise the style of your home! This classically inspired daybed is part of Homelegance’s Adalie Collection, and it offers you the traditional styling of a daybed with stylish double nail head accenting on the panels to bring an extra touch of elegance to the design. As an additional touch, button tufted accents bring extra style to the bed’s siding. Pulling out the included daybed couldn’t be easier, ensuring that you are never short on necessary sleeping space again. When you have small space, but need to have to beds for sleeping, a trundle bed may be exactly what you need. The trundle bed slides under the bed, is generally a bit smaller than the top bed, and has wheels so it will move easily in and out along the floor. So, when not in use, the trundle bed is concealed and out of the way under the larger bed, taking up much less space than two beds would. Simply pull it out when needed and you have two sleeping areas! What kind of trundle frame? There are two main kinds of trundle beds, both performing the same function of going under the main bed and being concealed when not in use. One is called a “pop-up”, and does exactly that. It comes out from under the main bed, and then raises up to be at the same height as the other mattress. Imagine your twin bed suddenly growing to the size of a king bed! The second is a “low-boy”, which simply means that the mattress slides out from under the main bed and stays in a lower position. This kind is generally used as extra sleeping area for guests or sleepovers for children. Do you need a trundle bed? Generally, a trundle bed, because of space requirements, will have a more slender mattress, which is not as suited for long term use for adults. For guests and children these beds are very useful, but you may want to avoid them for people with mobility or pain issues as the beds are lower to the ground (unless they are pop-ups) and have less support than a traditional bed. Who buys a bed with trundle? Most people who choose a trundle bed are dealing with space issues and a need for more sleeping areas. In the space of one bed, you have two. When you need another sleeping area you pull out the trundle and set up the bed for comfortable sleeping. There are many design styles of trundle beds, and many are built to be a daybed or couch-like piece when not used for sleeping. This way you have double the space use. Some are made so there are even drawers that folks often use to house the added bedding needed for the trundle. Trundle beds can be useful in several ways, serving different purposes based on your needs. Extra space for sleeping – at the most basic, a trundle bed provides additional sleeping space without taking up the space for two mattresses when not in use. Given the need for the trundle mattress to slide under the top mattress, the trundle mattress will be a little smaller than the upper, so it can fit. Whatever size your top bed is will determine the size of the bed below. Some people choose to have a twin bed or a double, depending upon how much space they need for extra sleeping. In the case of a bunk bed, the upper mattress is smaller than the upper, limiting sleeping space. Because of the size of trundle beds, there is not a box spring, reducing the supportive nature of the mattress. This isn’t generally a problem for short term sleeping or for children, however is not recommended for people of advanced age due to the reduced support, and also the typically lower height of the trundle bed which is a challenge for mobility. Space for storage – a trundle bed can have the mattress removed and stored elsewhere, and drawers then placed in the sliding frame to be underneath the bed, providing storage space for many things. Some people choose to use it to store bedding for their trundle bed, or children’s toys as storage space may be a premium for busy children. When the bed space is needed, the drawers are removed and the mattress is replaced in the frame. Safer than bunk beds – the height of bunk beds can be a concern, due to falling risk, and if you have a ceiling fan it can also be a risk for an accident. Also, some rooms do not have the height to allow bunk beds so the top bed is comfortable for the sleeper. Many adults do not feel comfortable on bunk beds either. Trundle beds may be a better answer for guest and children’s sleepovers in your situation. How are trundle frames made? There are many variety of trundle beds and you will be able to find one to compliment your décor and go with your other furniture. Wood, metal, fabric upholstery are all things you will find in various trundle beds. Wood construction – this is the most common in furniture making. It is very pretty, can come in a variety of stains and intensities to give you furniture that goes with the rest of your room design. Most beds are made out of wood, including the trundle frames. You are more likely to find trundles with storage in the wooden models. When made of good quality materials the bed will slide easily and require little upkeep for good function. Metal construction – if you are needing to move your bed at any time, you will find that a metal bed is lighter than a wooden one. There are many metal beds on the market, and come in a variety of design styles, trending toward a more modern look. Metal design is less costly than wooden design as well, an attractive feature to many consumers. On the other hand, you are less likely to find a metal bed with storage space, and if you can find one with storage space it is likely to be significantly more expensive. Most of these are custom made as well, which adds to the cost. Sizes? What options are there? Generally, trundle beds are designed for areas where space is at a premium, so you will not find too many options for sleeping space. You will very infrequently find one as large as a queen sized bed, as they are usually only made in twin and double sizes. Frankly, the main issue is the size the bed would take up when the trundle is pulled out to be used as sleeping space. Few rooms could contain two queen sized beds at the same time. So, you will want to measure your room planning for two beds to be sure that your trundle will be able to be fully opened. Consider space for getting around the bed so people can easily walk around when the beds are pulled out. You will need to decide what size bed will work for your room. Your upper mattress is not limited as much as the lower mattress is. You have more choice options for your upper mattress, but given size restrictions, your lower mattress will be smaller, about eight to ten inches in height. Remember that you won’t have a box spring with your lower mattress, so you will want to thoroughly investigate your different mattress options. To get more support, and not have a box spring, most people find memory foam mattresses to be more supportive and comfortable. This will help your guests to sleep in more comfort!